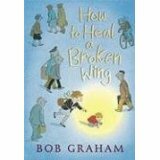 Summary: How to Heal a Broken Wing is a lovely story of a young boy’s notice and care for a fallen and injured bird. Literary Elements at Work: One of the most important literary elements at work in this story is the artistry. A nonreader could easily follow this story by following the illustrations. The words are almost secondary. Bob Graham uses height to demonstrate the bird’s fall. He uses perspective and color to demonstrate the child’s and the bird’s viewpoint, as well as to communicate feeling. For example, as the fallen bird lies injured and people are passing by, the illustrations are black and white. Will and the bird contain the only color until the bird is discovered by Will, taken home and cared for, begins to heal, and is released. Each page’s design contains setting, mood, character development, time, and exposition. Bob Graham’s artistic skill masterfully tells a rich and warm tale of healing. Theology: God loves us so deep and wide that God sent to us Jesus the Christ, who triumphed over sin and death for us. We love God when we feed and tend God’s “sheep,” creation—all of creation. Sit beside your child, let her hold the book and turn the pages. Ask her to tell you what she sees on the first page, as she describes what she sees, point to objects; read the first page following the words with your fingers; let her follow the words with her finger. (You could cup her hand in yours and follow along together.) Repeat this process on each page. Visit the Carolina Raptor Center. They rehab injured birds that people find and bring in. Each bird at the Raptor Center has its story. Ask about the birds’ stories. Ask what you can do to support their work. For another review of this same title, see the post on November 3, 2009. How to Heal a Broken Wing by Storypath is licensed under a Creative Commons Attribution-NonCommercial 4.0 International License.